That’s right folks; get used to it! Here is Homeland Security and the Jersey City Police Department strutting their stuff right in the busy plaza of Journal Square. 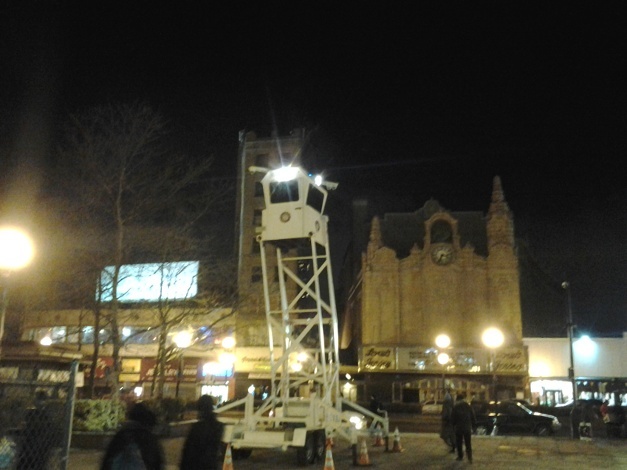 Despite numerous citizen complaints made over the weekend, this gun/surveillance tower is still unleashed upon our community. I suppose I should be like most of the sheople who “feel safer” with a cameras trained on them by DHS personnel (who never swear an oath to the Constitution). I just can’t get past the blatant and obvious indoctrination exercise being conducted on the people of Jersey City. Notice how this goon-toy is displayed for all to see and be exposed to, right in the center of the plaza? The location and active lights makes it very clear the tower was not simply making a pit-stop while being moved throughout the city. If that were the case, JCPD could have chosen a discreet location. No boys and girls, this gun tower is being shoved right in your faces; a trophy of the growing police state we are all being groomed to serve. Hmmm, looks just like the ones from which Nazi guards watched anti gun Mayor Fulop’s grandparents in the concentration camps. Your answer shows real intgelilence.